Not everything is as it seems, but some things are. 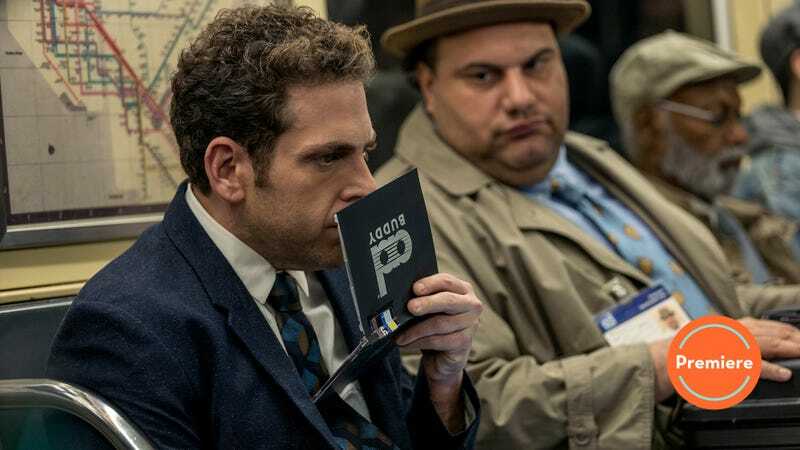 Owen Milgrim, played by Jonah Hill is, as far as we can tell, pretty much exactly what he seems. The character is named as a not-particularly-subtle reference to the Milgram Experiment, an infamous test of people’s willingness to obey authority. In Owen’s case, there are two authorities. One, his father, played by Gabriel Byrne. Hill may be a movie star, but his extreme discomfort—Hill’s unavoidable Jewishness—clashes aggressively with Byrne and the rest of his WASP family, which includes four nearly-indistinguishable blonde brothers, all of whom I briefly thought were played by John Early. (Sadly, they are not.) Owen is testifying on behalf of one of those brothers, who we are led to believe has committed sexual assault and needs an alibi in order to get off. The second authority is a mysterious additional brother, who we are led to believe is a manifestation of Owen’s long-standing psychosis. This brother appears at random (sometimes with a pencil mustache and slicked-back hair), telling Owen he has a hidden purpose to save the galaxy, and asking him to keep an eye out for his new “contact.” These scenes are just part of the ways Maniac unsettles Owen’s perception of reality, including a constant effect where things around him shake and a brief moment where kernels on the ground appear to burst into popcorn. Not everything is as it seems—especially Maniac. It’s not surprising that a streaming television show starts slow; it’s practically a requirement of the genre by now. Netflix seasons tend to exist in misshapen lumps, averse to things like “pacing” or “episodes.” And though there are lots of things to love in this episode, there’s also maybe a bit too much. Take the scene where Owen’s family sits around the dinner table, blathering about nothing while repeatedly asking him to play Balderdash. This goes on for about two minutes too long, and it’s one of several scenes that drags without the hard boundary of a commercial break: “The Chosen One!” is 40 minutes long, edging toward the normal length for a TV drama. For some, this might be a feature—Maniac is “blurring” the lines between comedy and drama. Why even label things, you know? But the long stretches where that tone is inconsistent, or unclear, swallow the moments that are funny, like the final “question” in Owen’s intake interview for the drug study, in which the woman administering the test just stares at him until a light on one of her machines lights up. And all of this is getting stacked on top of the other elements of Maniac’s world, slight differences from 2018 that don’t feel like huge changes, but that still need to be established in a first episode. There are Ad Buddies, people who essentially exist as living embodiments of free-to-play games (watch an ad, get some slight benefit). Everyone’s computer looks like it’s from the mid-’90s, and straight out of The Matrix’s office scenes. Apartments all look like pods, in someone’s production-design mirage of an Americanized Tokyo. And all of this feels like the outer shell of the real purpose of the episode: Getting Owen to meet Annie, the other protagonist, played by Emma Stone. Annie is in all of the ads Owen sees over the course of the episode, which leads him to become fascinated with her when they meet in the drug study. (It probably doesn’t help that Owen is conspicuously not taking his medication.) And though we know enough about Owen (and Jonah Hill looks beaten-down enough) to sympathize, his fascination with Annie is one of the least interesting things about the show so far—even though it’s her first moment of screen time, it’s hard not to feel bad for Annie being bothered by this guy she’s never met. Instead, the most compelling part of Maniac, at least right now, is the most heavily-stylized component of the show: A quick glimpse of the people behind the drug trial, two Japanese scientists named Dr. Fujita (Sonoya Mizuno) and Dr. Muramoto (Rome Kanda). The deadpan insanity of the study, along with the quasi-instructional video that begins the episode, narrated by Justin Theroux, feels far more intoxicating than the other supposedly unsettling parts of Maniac. Hopefully, it will keep building. My favorite part of this episode is pleasantly understated, but still gets a bit lost in the rest of the stuff happening: People repeatedly mistaking Owen’s reticence and social awkwardness for sarcasm. Jemima Kirke is exceedingly well-cast as the fiancee of one of the brothers, Owen’s pseudo-love interest and a cynical, surprisingly empathetic pre-heiress. Welcome to The A.V. Club’s Maniac coverage! I’ll be getting as many of these out as I can this weekend.